We originally booked this cruise for the fall of 2017 while on board Silhouette in the British Isles in 2016. This was one of the few cruises offered by our favorite cruise line, Celebrity, that was still on our bucket list. Our plan, when booking it, was to take any cabin, knowing full well that when Celebrity announced the 2018 deployments we would switch on the first day staterooms became available for this cruise and get the stateroom we wanted. This cruise was on Summit, one of Celebrity&apos;s older M-class ships. We had sailed on her sister ship Infinity (exactly the same ship) six different times so we knew exactly what we wanted—an aft cabin. So when this cruise opened for booking we grabbed it on the first day it was available and got a great aft cabin on deck eight. Our original plan was to do this cruise by ourselves, without any of our Martini Mates, Silhouetters or friends. Just us. So when we booked this cruise we planned some shore excursions with two other couples on the Cruise Critic roll call. This set up a very different dynamic than when we usually sail together. While we usually do shore excursions together, eat dinner together, we wouldn&apos;t be able to do that on this cruise as they booked Aqua class (which eats dinner in Blu) while we would be eating in the Main Dining Room (MDR). But we still spent a great deal of time with the four of them but for Kathleen and I, it made it a very different cruise. Disclaimer I came back to add this because it needs to be said. I had a really hard time writing this review because of a number of things but the biggest of them (that colored more than half the cruise) was the fact that we both caught horrid colds about midway through the cruise. Kathleen got it first and I followed soon after. There is nothing worse than being sick on a ship and this really sucked. As I write this (almost two weeks later) I am still coughing. Totally sick of being sick. Just wanted you to know that up front. It didn&apos;t really change the quality of the cruise but it did change some of our experiences and that made the trip wind up on a very sour note. Embarkation/Disembarkation From our AirBnB in Manhattan we were picked up (right on time) by Carmel Limo and driven underneath the Hudson River to the Cape Liberty cruise port in Bayonne, New Jersey. It was Sunday, which meant that even though we had been told it would take about an hour to get to the port from downtown Manhattan, it only took us about 20 minutes flat. So we arrived early (around 10:15) which meant we had to wait about 45 minutes in the terminal before we were allowed on the ship. Once we were onboard we went right to the buffet to grab some burgers and started using our drinks package. Staterooms were released at 1:15 and we were in ours five minutes later. An even bigger surprise was that our luggage was already in the hallway which meant we got to unpack and fix up our cabin at one of the earliest time ever, on any Celebrity cruise. Disembarkation was fine. We were off within minutes of when we were told we would be. There is quite a bottleneck in the port to pick up luggage. You have to face off with video screen to clear customs but once you are through there it&apos;s an easy disembark. The Food Let&apos;s be honest, so much of cruising is about the food. Let&apos;s start with breakfast. We ate pretty much every breakfast in the buffet. We prefer Blu for breakfast but since we weren&apos;t in Aqua on this trip, off to the buffet we went. On day two I discovered the Eggs Benedict station which was on the starboard side of the buffet, all the way aft. During lunch it is the pizza spot. The Eggs Benedict were superb. I think I ate them just about every morning. They had a variety of styles to choose from but I got hooked on the Mexican ones. The guy cooking would slather guacamole on the English muffin, then salsa, then the perfectly poached egg, then hollandaise sauce. My mouth is watering just writing about it. I can&apos;t say a lot about lunch as we either skipped it (after that huge breakfast), were off the ship in ports or we caught a quick burger, salad or pizza in the buffet. We did do lunch in the dining room twice and it was fine. Nothing to be thrilled with. For dinner we normally do early seating or are in Blu because we are in Aqua class but this time since we were in a Concierge cabin and weren&apos;t eating in Blu, we decided to try Anytime Dining. We did not reserve our seating time in advance. To be honest, I just didn&apos;t think it was necessary and it turned out I was right as there was usually a longer line to get in for those with reservations than those without. The first night we ate in the dining room we had to wait about 30 minutes to get a table. The second night we were given a pager and waited about 45 minutes. After that, we would go a little later (6:00 instead of 5:30) and we usually got in within 10 minutes or so. We always asked for a table of six or eight. We eat by ourselves most nights at home so we like to socialize at dinner. Strangely we wound up at a table (different tables) with just about the same people almost every night we ate in the dining room. This was both a good and bad thing. We liked the people but we were looking for some variety. The food was fine but nothing special. Some of the items on the menu have been there since our first Celebrity cruise in 2004. That&apos;s just sad. Service in the dining room was good. Be aware that if you take this particular cruise (New England Fall Foliage) that it will be a predominately older crowd so if you don&apos;t want to wait in line, go to dinner later or book traditional Late seating. All our friends who had Late seating told us it was emptier and the service was better and more relaxed. We had great service but there just weren&apos;t enough people doing the serving. See my note below about the problems that X has. We did two different nights in speciality restaurants—one in Qsine and one in the Tuscan Grille. Qsine is one of my favorite restaurants anywhere because I love the variety. We had made a reservation pre-cruise for 14 so we could get the big table for a reunion of our Silhouetter buddies and we had an amazing time. There was a snafu with the billing (we had prepaid but the restaurant did not have record that we did) but the meal was AMAZING. I will be sorry to see this version of Qsine go to make room for Le Petit Chef at Qsine or whatever they are calling it. Our night in the Tuscan was almost as good. Service was outstanding, we got a nice discount, we had a bunch of fun with all our friends (we took another big group—this time 10 of us). Which brings me to a comment my brother made. Why can&apos;t X make food that is as good as the food they serve in the speciality restaurants for the MDR or the buffet? I mean simple stuff, like desserts for instance. The desserts in the buffet are puffs of air compared to the desserts in Tuscan Grille. I know you get what you pay for but I seem to remember when dinner in the MDR featured that kind of food. The food we had in both Qsine and the Tuscan Grille was FAR superior to anything else I had on board...other than the Eggs Benedict. That was the best thing I ate. Well maybe that was the Qsine lamb chops. The Weather Normally I wouldn&apos;t have an entire section in a review about the weather but so much of this cruise was about the weather. For our entire time in NYC, even though it rained a few times, the highs were in the mid 70s. With horrible humidity. Horrible for us. Here in Seattle we don&apos;t ever get that warm and that humid at the same time. On the cruise, the weather turned even weirder. Our first three days—sailaway from New Jersey, our stops in Boston and in Portland, Maine—were downright warm. The high in Boston on October 9 when we were there was 86 degrees. Even crazier, the high in Portland, Maine on October 10 was 84. In the sun it was substantially warmer. Then the very next day when we were supposed to stop in Bar Harbor, Maine the ship wasn&apos;t able to because of the high seas and the wind. From that point on we had some of the rockiest weather we have ever had on a cruise. Going around Nova Scotia and across the Gulf of St. Lawrence until we were in the St. Lawrence seaway, we rocked and rolled the entire time. The same was true on the way out of Québec as well. That meant that on a 14 night cruise, we had at least 6 days that featured some heavy oceans. Another weather consideration if you are thinking of taking this cruise would be the lateness in the past few years of the fall foliage colors. Celebrity offers this itinerary three times each fall. As of now, you can take it in early September, mid-September or when we did—early October. It used to be (10 years ago) that the best foliage was on the middle cruise. As the globe has warmed up, fall colors are getting later and later each year. For instance, on our pre-trip we barely saw reds, oranges or yellows in Vermont or upstate New York. On the cruise we really didn&apos;t see incredible fall colors until we were on our way into Québec. Totally amazing (check out the pics in the slide show on the home page). The Ship Summit is in OK condition for a ship that was launched in 2001. She was "Solsticized" in the late 2000s after the Solstice line of ships joined Celebrity, but she is in need of another fix up. There is nothing horribly wrong, just rust showing on verandahs, creaking floors, verandah doors that sticks and other symptoms of an older ship. The rumors are that Summit will be going into dry dock in 2019 and we hope that is the case. The rest of the ship also needs updating. The public areas are still nice. Definitely an improvement on the RCL ship we sailed on two weeks before we left on this cruise. That ship (Explorer of the Seas) was built around the same time but looks much more the worse for wear. That said, I now believe I like the Solstice class ships more than the Millennium class. They just have so much more to offer and so much of the M-class ships have been just had things added on to them which makes them much more hodge-podge than ships that are built for a purpose. A great example are the dining rooms. On M-class ships the Aqua class dining room is an add-on, carved out of the main dining room but on the S-class they are purpose-built and feel more natural, like they belong there. I will say that parts of the ship are in great shape, like the gym. Lots of great equipment, kept in pristine condition, open almost all the time and just an all around great place to work out. The Martini Bar, the Main Dining Room (MDR) and other large venues are still almost as nice as they day they were built and put in service. The worst part of the cruise We had one major complaint about this cruise: the ship is understaffed. That&apos;s the best way to put it. We found so many great, hard working Celebrity crew members that did the very best they could but there just weren&apos;t enough of them. Some examples: We were in the Rendezvous Lounge before dinner and there were at least 100 people in the lounge and about 20 of them waiting at the bar and there was just ONE bartender. That&apos;s it. We were in the buffet for dinner. We had our dinner and we waited more than 20 minutes for a server to come by and offer us a glass of wine or a cocktail. I finally got up and walked to the bar on the far end of the buffet and got my wife a glass of wine and ordered a drink for myself. The bartender there said that he would bring it to me. About 20 minutes later, I finally got up and went back to get it. Another night in the buffet, it was a SPECIAL burger night at the grille at the back of the buffet. I went back there on three separate occasions about 15 minutes apart and each time there was a line of 8-10 people waiting and ONE crew member working. On a daily basis in the Rendezvous Lounge there was only one server for the entire side of the lounge, more than 150 plus people. My brother, his wife and our two best friends were in Aqua and eating in Blu. There was one sommelier in the entire restaurant each night for more than 150 diners. Good luck if you were looking for a different bottle of wine or a maybe just a second or third glass with dinner. We had the best stateroom attendant we have ever had on any of our 26 cruises (17 with Celebrity) but he worked with no help whatsoever. Not sure he ever got any time off. When we first sailed Celebrity in 2004, stateroom attendants had an assistant and were responsible for about 15 staterooms. our amazing stateroom attendant had no assistant and at least 20 staterooms to attend to. As a long-time Celebrity cruiser who loves the Celebrity product, I will have a much harder time recommending Celebrity after this experience, especially with the staffing situation becoming even thinner with their concentration on their new ship Edge to the detriment of the other ships in the fleet. There were other problems (all fixable, as is this one) but this is the biggest one and it faces the entire industry with the onslaught of more than 120 new ships coming in the next five years. Lastly, I want to mention that at least twice I went to ask to speak to the Hotel Director or Food and Beverage Manager about this situation. I went to Guest Relations and was told someone would contact me. I was never contacted. Television and internet connectivity sucked! The television experience on this cruise was the WORST I have ever had at sea after 25+ cruises. I know, I am on a cruise, do I really need to watch TV? Yes. Because my wife and I both caught horrible colds and just needed a day to be sick in our cabin. We wanted to take our minds off of how we felt by watching television. Good luck! Nothing on at all. Barely got the map of where we were. When something would come on the reception was horrible and the selection even worse. HGTV that flickered in and out and was cut to ribbons by Celebrity to eliminate commercials. Cooking channel that repeated the same shows over and over again. Celebrity&apos;s television experience has gotten worse and worse over the years. Now I totally get problems with satellite reception. Weather can screw that up and on this cruise we had some crazy weather. But couldn&apos;t they PLEASE put some movies, TV shows, anything on their server that we can access while at sea. The only option other than the aforementioned lousy programming were movies that were chargeable at $14.95 per viewing. Most of them were old. Something that I would find free on Netflix or Amazon Prime. Last summer we did a quick HAL cruise to Alaska and their TV was AWESOME! Tons of free movies, the full catalog of BBC nature films and so much more. Incredible 4K televisions in every cabin. Makes X look sad in that department. I have had people ask me why I didn&apos;t just stream Netflix or Amazon? Well besides only having Elite Plus internet minutes, in our aft cabin, the connectivity was HORRID! I ran a couple of speed tests and got barely .3 megabytes per second up (at home I get 50 MB up and down). Yes, .3! My brother had better luck than I did and I think that may have been because of his placement on the ship (remember, we were in an aft cabin) but when I would go forward and sit in a common area, mine wasn&apos;t much better. A little about those people who did great work Let&apos;s start with the best stateroom attendant we have ever had in more than 23 cruises, Eddie who took care of us in stateroom 8176. The photo below are our gang, the Cruise Ruiners with the amazing Marly from Columbia in the Rendezvous Lounge. She was beyond phenomenal. Never seen anyone work so hard. The entire crew in Cafe Al Bacio was awesome. The amazing Voltan who was EVERYWHERE in every dining venue at all hours of the day and night. All the guys who make eggs Benedict in the buffet—the best I have ever had and I love eggs Benedict. We are big trivia fans and the activities staff that ran the daily trivia contests were awesome. And there were a lot of them. Some sea days there were four sessions. I do wish they were all up in the Revelations Lounge where everyone could see the screen they were projecting video questions on but that&apos;s a minor complaint. The staff did a great job running the games. We were pretty much one of the top teams. Our team name was the "Cruise Ruiners" because one lady thought we were talking a little too loudly during a bingo session that preceded one of the trivia games and told us we had "ruined her cruise." The name just stuck. Maybe we&apos;ll get shirts. The People who were Disappointing Some of the people who were not so good: The guest relations people who told me they would have someone call me back but never did (about our ongoing issues). The manager of Qsine who woke me out of sound sleep because he thought we had walked away from the tab on a table for 14 when we had paid pre-cruise as a group through the group department almost a month before we sailed. He did apologize after waking me up with a phone call at almost 10:00 pm but there is no excuse for this. Where did he think we were going to go to get away from him? Jump ship and ditch the last 10 days of the cruise? The Concierge who was supposed to be there to help us as well as the special events coordinator who turned the Cruise Critic group down cold when we asked to be able to have lunch together in the dining room on the last sea-day. This is something that we have had no problem arranging on Infinity, Silhouette, Solstice and Eclipse on previous voyages. These people were totally unhelpful. Would I recommend this cruise to a friend? They ask this on the Celebrity cruise evaluation that they send you. Well, I would recommend it but as it stands now, I would tell them that before they consider taking Summit to New England, they need to re-evaluate whether they want to sail on a ship that is so understaffed. If they are willing to wait 20-30 minutes for a cocktail or glass of wine. That If they want anytime dining they might have to be willing to wait 30 to 45 minutes to be seated. They also need to think about what will happen if they become ill and want to just lay in their staterooms and watch the WORST television on the high seas. Holland America makes Celebrity&apos;s television look like the 1950s. They need to decide if they want (or can) sail and be away from work and family with the WORST internet connectivity ever. My average download speed was under 1 MBPS and upload speed (I need to upload changes to websites when on vacation) was NON-existent. I would tell them that if they can put up with this, then maybe Summit to New England is for them. I would tell them that the crew that will be sailing with them there are OUTSTANDING and trying as hard as they can to help them have a great vacation. The Hotel Frontenac in Québec as seen from the deck of Summit. We originally booked this cruise for the fall of 2017 while on board Silhouette in the British Isles in 2016. This was one of the few cruises offered by our favorite cruise line, Celebrity, that was still on our bucket list. Our plan, when booking it, was to take any cabin, knowing full well that when Celebrity announced the 2018 deployments we would switch on the first day staterooms became available for this cruise and get the stateroom we wanted. This cruise was on Summit, one of Celebrity&apos;s older M-class ships. We had sailed on her sister ship Infinity (exactly the same ship) six different times so we knew exactly what we wanted—an aft cabin. So when this cruise opened for booking we grabbed it on the first day it was available and got a great aft cabin on deck eight. Our original plan was to do this cruise by ourselves, without any of our Martini Mates, Silhouetters or friends. Just us. So when we booked this cruise we planned some shore excursions with two other couples on the Cruise Critic roll call. This set up a very different dynamic than when we usually sail together. While we usually do shore excursions together, eat dinner together, we wouldn&apos;t be able to do that on this cruise as they booked Aqua class (which eats dinner in Blu) while we would be eating in the Main Dining Room (MDR). But we still spent a great deal of time with the four of them but for Kathleen and I, it made it a very different cruise. I came back to add this because it needs to be said. I had a really hard time writing this review because of a number of things but the biggest of them (that colored more than half the cruise) was the fact that we both caught horrid colds about midway through the cruise. Kathleen got it first and I followed soon after. There is nothing worse than being sick on a ship and this really sucked. As I write this (almost two weeks later) I am still coughing. Totally sick of being sick. Just wanted you to know that up front. It didn&apos;t really change the quality of the cruise but it did change some of our experiences and that made the trip wind up on a very sour note. From our AirBnB in Manhattan we were picked up (right on time) by Carmel Limo and driven underneath the Hudson River to the Cape Liberty cruise port in Bayonne, New Jersey. It was Sunday, which meant that even though we had been told it would take about an hour to get to the port from downtown Manhattan, it only took us about 20 minutes flat. So we arrived early (around 10:15) which meant we had to wait about 45 minutes in the terminal before we were allowed on the ship. Once we were onboard we went right to the buffet to grab some burgers and started using our drinks package. Staterooms were released at 1:15 and we were in ours five minutes later. An even bigger surprise was that our luggage was already in the hallway which meant we got to unpack and fix up our cabin at one of the earliest time ever, on any Celebrity cruise. Disembarkation was fine. We were off within minutes of when we were told we would be. There is quite a bottleneck in the port to pick up luggage. You have to face off with video screen to clear customs but once you are through there it&apos;s an easy disembark. Let&apos;s be honest, so much of cruising is about the food. Let&apos;s start with breakfast. We ate pretty much every breakfast in the buffet. We prefer Blu for breakfast but since we weren&apos;t in Aqua on this trip, off to the buffet we went. On day two I discovered the Eggs Benedict station which was on the starboard side of the buffet, all the way aft. During lunch it is the pizza spot. The Eggs Benedict were superb. I think I ate them just about every morning. They had a variety of styles to choose from but I got hooked on the Mexican ones. The guy cooking would slather guacamole on the English muffin, then salsa, then the perfectly poached egg, then hollandaise sauce. My mouth is watering just writing about it. I can&apos;t say a lot about lunch as we either skipped it (after that huge breakfast), were off the ship in ports or we caught a quick burger, salad or pizza in the buffet. We did do lunch in the dining room twice and it was fine. Nothing to be thrilled with. For dinner we normally do early seating or are in Blu because we are in Aqua class but this time since we were in a Concierge cabin and weren&apos;t eating in Blu, we decided to try Anytime Dining. We did not reserve our seating time in advance. To be honest, I just didn&apos;t think it was necessary and it turned out I was right as there was usually a longer line to get in for those with reservations than those without. The first night we ate in the dining room we had to wait about 30 minutes to get a table. The second night we were given a pager and waited about 45 minutes. After that, we would go a little later (6:00 instead of 5:30) and we usually got in within 10 minutes or so. We always asked for a table of six or eight. We eat by ourselves most nights at home so we like to socialize at dinner. Strangely we wound up at a table (different tables) with just about the same people almost every night we ate in the dining room. This was both a good and bad thing. We liked the people but we were looking for some variety. The food was fine but nothing special. Some of the items on the menu have been there since our first Celebrity cruise in 2004. That&apos;s just sad. Service in the dining room was good. Be aware that if you take this particular cruise (New England Fall Foliage) that it will be a predominately older crowd so if you don&apos;t want to wait in line, go to dinner later or book traditional Late seating. All our friends who had Late seating told us it was emptier and the service was better and more relaxed. We had great service but there just weren&apos;t enough people doing the serving. See my note below about the problems that X has. We did two different nights in speciality restaurants—one in Qsine and one in the Tuscan Grille. Qsine is one of my favorite restaurants anywhere because I love the variety. We had made a reservation pre-cruise for 14 so we could get the big table for a reunion of our Silhouetter buddies and we had an amazing time. There was a snafu with the billing (we had prepaid but the restaurant did not have record that we did) but the meal was AMAZING. I will be sorry to see this version of Qsine go to make room for Le Petit Chef at Qsine or whatever they are calling it. Our night in the Tuscan was almost as good. Service was outstanding, we got a nice discount, we had a bunch of fun with all our friends (we took another big group—this time 10 of us). Which brings me to a comment my brother made. Why can&apos;t X make food that is as good as the food they serve in the speciality restaurants for the MDR or the buffet? I mean simple stuff, like desserts for instance. The desserts in the buffet are puffs of air compared to the desserts in Tuscan Grille. I know you get what you pay for but I seem to remember when dinner in the MDR featured that kind of food. The food we had in both Qsine and the Tuscan Grille was FAR superior to anything else I had on board...other than the Eggs Benedict. That was the best thing I ate. Well maybe that was the Qsine lamb chops. Normally I wouldn&apos;t have an entire section in a review about the weather but so much of this cruise was about the weather. For our entire time in NYC, even though it rained a few times, the highs were in the mid 70s. With horrible humidity. Horrible for us. Here in Seattle we don&apos;t ever get that warm and that humid at the same time. On the cruise, the weather turned even weirder. Our first three days—sailaway from New Jersey, our stops in Boston and in Portland, Maine—were downright warm. The high in Boston on October 9 when we were there was 86 degrees. Even crazier, the high in Portland, Maine on October 10 was 84. In the sun it was substantially warmer. Then the very next day when we were supposed to stop in Bar Harbor, Maine the ship wasn&apos;t able to because of the high seas and the wind. From that point on we had some of the rockiest weather we have ever had on a cruise. Going around Nova Scotia and across the Gulf of St. Lawrence until we were in the St. Lawrence seaway, we rocked and rolled the entire time. The same was true on the way out of Québec as well. That meant that on a 14 night cruise, we had at least 6 days that featured some heavy oceans. Another weather consideration if you are thinking of taking this cruise would be the lateness in the past few years of the fall foliage colors. Celebrity offers this itinerary three times each fall. As of now, you can take it in early September, mid-September or when we did—early October. It used to be (10 years ago) that the best foliage was on the middle cruise. As the globe has warmed up, fall colors are getting later and later each year. For instance, on our pre-trip we barely saw reds, oranges or yellows in Vermont or upstate New York. On the cruise we really didn&apos;t see incredible fall colors until we were on our way into Québec. Totally amazing (check out the pics in the slide show on the home page). Summit is in OK condition for a ship that was launched in 2001. She was "Solsticized" in the late 2000s after the Solstice line of ships joined Celebrity, but she is in need of another fix up. There is nothing horribly wrong, just rust showing on verandahs, creaking floors, verandah doors that sticks and other symptoms of an older ship. The rumors are that Summit will be going into dry dock in 2019 and we hope that is the case. The rest of the ship also needs updating. The public areas are still nice. Definitely an improvement on the RCL ship we sailed on two weeks before we left on this cruise. That ship (Explorer of the Seas) was built around the same time but looks much more the worse for wear. That said, I now believe I like the Solstice class ships more than the Millennium class. They just have so much more to offer and so much of the M-class ships have been just had things added on to them which makes them much more hodge-podge than ships that are built for a purpose. A great example are the dining rooms. On M-class ships the Aqua class dining room is an add-on, carved out of the main dining room but on the S-class they are purpose-built and feel more natural, like they belong there. I will say that parts of the ship are in great shape, like the gym. Lots of great equipment, kept in pristine condition, open almost all the time and just an all around great place to work out. The Martini Bar, the Main Dining Room (MDR) and other large venues are still almost as nice as they day they were built and put in service. We had one major complaint about this cruise: the ship is understaffed. That&apos;s the best way to put it. We found so many great, hard working Celebrity crew members that did the very best they could but there just weren&apos;t enough of them. We were in the Rendezvous Lounge before dinner and there were at least 100 people in the lounge and about 20 of them waiting at the bar and there was just ONE bartender. That&apos;s it. We were in the buffet for dinner. We had our dinner and we waited more than 20 minutes for a server to come by and offer us a glass of wine or a cocktail. I finally got up and walked to the bar on the far end of the buffet and got my wife a glass of wine and ordered a drink for myself. The bartender there said that he would bring it to me. About 20 minutes later, I finally got up and went back to get it. Another night in the buffet, it was a SPECIAL burger night at the grille at the back of the buffet. I went back there on three separate occasions about 15 minutes apart and each time there was a line of 8-10 people waiting and ONE crew member working. On a daily basis in the Rendezvous Lounge there was only one server for the entire side of the lounge, more than 150 plus people. My brother, his wife and our two best friends were in Aqua and eating in Blu. There was one sommelier in the entire restaurant each night for more than 150 diners. Good luck if you were looking for a different bottle of wine or a maybe just a second or third glass with dinner. We had the best stateroom attendant we have ever had on any of our 26 cruises (17 with Celebrity) but he worked with no help whatsoever. Not sure he ever got any time off. When we first sailed Celebrity in 2004, stateroom attendants had an assistant and were responsible for about 15 staterooms. our amazing stateroom attendant had no assistant and at least 20 staterooms to attend to. As a long-time Celebrity cruiser who loves the Celebrity product, I will have a much harder time recommending Celebrity after this experience, especially with the staffing situation becoming even thinner with their concentration on their new ship Edge to the detriment of the other ships in the fleet. There were other problems (all fixable, as is this one) but this is the biggest one and it faces the entire industry with the onslaught of more than 120 new ships coming in the next five years. Lastly, I want to mention that at least twice I went to ask to speak to the Hotel Director or Food and Beverage Manager about this situation. I went to Guest Relations and was told someone would contact me. I was never contacted. Television and internet connectivity sucked! The television experience on this cruise was the WORST I have ever had at sea after 25+ cruises. I know, I am on a cruise, do I really need to watch TV? Yes. Because my wife and I both caught horrible colds and just needed a day to be sick in our cabin. We wanted to take our minds off of how we felt by watching television. Good luck! Nothing on at all. Barely got the map of where we were. When something would come on the reception was horrible and the selection even worse. HGTV that flickered in and out and was cut to ribbons by Celebrity to eliminate commercials. Cooking channel that repeated the same shows over and over again. Celebrity&apos;s television experience has gotten worse and worse over the years. Now I totally get problems with satellite reception. Weather can screw that up and on this cruise we had some crazy weather. But couldn&apos;t they PLEASE put some movies, TV shows, anything on their server that we can access while at sea. The only option other than the aforementioned lousy programming were movies that were chargeable at $14.95 per viewing. Most of them were old. Something that I would find free on Netflix or Amazon Prime. Last summer we did a quick HAL cruise to Alaska and their TV was AWESOME! Tons of free movies, the full catalog of BBC nature films and so much more. Incredible 4K televisions in every cabin. Makes X look sad in that department. I have had people ask me why I didn&apos;t just stream Netflix or Amazon? Well besides only having Elite Plus internet minutes, in our aft cabin, the connectivity was HORRID! I ran a couple of speed tests and got barely .3 megabytes per second up (at home I get 50 MB up and down). Yes, .3! My brother had better luck than I did and I think that may have been because of his placement on the ship (remember, we were in an aft cabin) but when I would go forward and sit in a common area, mine wasn&apos;t much better. Let&apos;s start with the best stateroom attendant we have ever had in more than 23 cruises, Eddie who took care of us in stateroom 8176. The photo below are our gang, the Cruise Ruiners with the amazing Marly from Columbia in the Rendezvous Lounge. She was beyond phenomenal. Never seen anyone work so hard. The entire crew in Cafe Al Bacio was awesome. The amazing Voltan who was EVERYWHERE in every dining venue at all hours of the day and night. All the guys who make eggs Benedict in the buffet—the best I have ever had and I love eggs Benedict. We are big trivia fans and the activities staff that ran the daily trivia contests were awesome. And there were a lot of them. Some sea days there were four sessions. I do wish they were all up in the Revelations Lounge where everyone could see the screen they were projecting video questions on but that&apos;s a minor complaint. The staff did a great job running the games. We were pretty much one of the top teams. Our team name was the "Cruise Ruiners" because one lady thought we were talking a little too loudly during a bingo session that preceded one of the trivia games and told us we had "ruined her cruise." The name just stuck. Maybe we&apos;ll get shirts. The guest relations people who told me they would have someone call me back but never did (about our ongoing issues). The manager of Qsine who woke me out of sound sleep because he thought we had walked away from the tab on a table for 14 when we had paid pre-cruise as a group through the group department almost a month before we sailed. He did apologize after waking me up with a phone call at almost 10:00 pm but there is no excuse for this. Where did he think we were going to go to get away from him? Jump ship and ditch the last 10 days of the cruise? The Concierge who was supposed to be there to help us as well as the special events coordinator who turned the Cruise Critic group down cold when we asked to be able to have lunch together in the dining room on the last sea-day. This is something that we have had no problem arranging on Infinity, Silhouette, Solstice and Eclipse on previous voyages. These people were totally unhelpful. Would I recommend this cruise to a friend? They ask this on the Celebrity cruise evaluation that they send you. Well, I would recommend it but as it stands now, I would tell them that before they consider taking Summit to New England, they need to re-evaluate whether they want to sail on a ship that is so understaffed. If they are willing to wait 20-30 minutes for a cocktail or glass of wine. That If they want anytime dining they might have to be willing to wait 30 to 45 minutes to be seated. Celebrity&apos;s television look like the 1950s. They need to decide if they want (or can) sail and be away from work and family with the WORST internet connectivity ever. My average download speed was under 1 MBPS and upload speed (I need to upload changes to websites when on vacation) was NON-existent. I would tell them that if they can put up with this, then maybe Summit to New England is for them. I would tell them that the crew that will be sailing with them there are OUTSTANDING and trying as hard as they can to help them have a great vacation. As I mentioned earlier, our cabin was 8176, which was an aft cabin that we really wanted to sail in again. 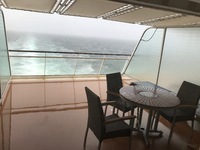 We have sailed in aft cabins on M-class ships six times before and they have the most amazing verandahs that are both huge and give you an 180 degree view of everything. That&apos;s Kathleen standing on our verandah below. The best part of this stateroom was our stateroom attendant, Eddie (that&apos;s him with Kathleen below). In more than 23 cruises, we have never had a stateroom attendant as great as he was to us. He was the hardest working, most congenial guy on the ship and he made our entire cruise better than it would it have been with anyone else taking care of us. Our first port was Boston. We had originally planned on meeting with our friends Renda and Jennifer who live in Boston and had visited us in Seattle last year. We sailed with them to the Baltic in 2013. Unfortunately Jennifer had to work and Renda is awaiting surgery so they couldn&apos;t make it. We decided to just do the Hop-On, Hop-Off (Ho-Ho) bus with my brother and his wife. The bus stops right at the end of the pier. It is less than a 5 minute walk from the end of the gangplank to where the bus picks you up. But note that the bus that picks you up there is NOT the bus you will tour Boston on. You will be taken into downtown (about a 10 minute drive) and then need to change buses. After doing that, we headed out for what was about a two hour trip around the town. Our normal practice when doing a Ho-Ho bus is to take the bus all the way around its entire route, hear all the narration and then on the second time around we hop off and on. We did just that, stopping the second time around at Old Ironsides (the USS Constitution) and downtown Boston where we got off and walked through the Faneuil Hall Marketplace. Then it was back to the ship. Later I walked about four miles back into town from the ship to pick up a Massachusetts Starbucks mug. What can I say, we collect them from the places we have been. After sailing some stormy seas on another sea day we arrived in Charlottetown on Prince Edward Island, Canada&apos;s smallest province. Upon leaving the ship we were met by our guide for the day, the wonderful Duncan and we were off to explore parts of Canada&apos;s smallest province. Duncan toured us all day long and was a superb guide. We saw Anne of Green Gables house, some incredible light houses, stopped by a place where we tasted and bought some of the best preserves ever and so much more. Duncan has been doing this for a very long time and really took great care of us. We even had a really cool encounter with a PEI fox. We would highly recommend touring with Duncan. He works with Target Tours and if you book with them, ask for Duncan. He&apos;s one of the best guides we have had in our travels. We spent a really nice day touring with Andy Smith, the owner and operator of Tattle Tours. We had prearranged this tour at the same time as the rest of our tours, about 14 months ahead of the cruise. When Andy isn&apos;t a tour guide, he is an actor so he can be very interesting to listen to. Andy does a variety of tours including walking tours of downtown Halifax and the tour we took, a drive to Peggy&apos;s Cove, Luneberg and Mahone Bay. Peggy&apos;s Cove is a postcard in the flesh with an amazing fishing village and lighthouse. Luneberg is a larger fishing village that is the home of the Bluenose (the ship you can see on the Canadian dime). Mahone Bay is a very nice town that just happens to be on the way back to Halifax. We had a very enjoyable day. We saw some great sights, had lunch at an outstanding restaurant in Luneberg named The Grand Banker. Had my first lobster roll there and some great beer. If you are in Luneberg, I highly recommend it. And I would highly recommend seeing these towns. One thing I can&apos;t recommend is Andy&apos;s Tattle Tours for this driving tour. Andy is a great tour guide, just not a great driver. While driving with Andy he gets too distracted doing the tour. We felt very unsafe quite a few times while driving. I noticed (being in the front seat) that he ran three stop signs that only by sheer luck we didn&apos;t get hit broadside. I truly believe that Andy should stick to the in-town walking tours he does where he can devote his entire time to being the guide and not the driver. The heat wave we had encountered in Boston (the high there on October 9 was 86) got worse in Portland. It only got to 84 in the shade but the sun was blisteringly hot (my guess is about 92). We had scheduled a food tour (Old Port Culinary Walking Tour) with Maine Foodie Tours. That turned out to be a HUGE mistake. First, we were told that our party (of 8) would be the only people on the tour and SURPRISE there were eight other people on the tour. The tour started at 10:00 AM when we all met at the Old Portland Wine Shop. We were hoping to have wine but the tour never went inside. Instead we moved to the back of the building next door, a spice shop. The shop was supposed to have AC and it might have but we couldn&apos;t tell. 16 of us were crushed into a space about 8 feet by 10 feet where we had to stand for about an hour while we first tasted a tiny glass of mead (honey wine) and then some of the worst macaroni and cheese with I have ever had with tiny bits of lobster in it to put some of the spices from the shop on. In the meantime our guide told us some fun Portland and food facts. When we were done eating (by now it is at least 11:00 am) our guide said you can now look at the rest of the store while I do the dishes...DO THE DISHES! On our time? And that friends is as much as I can tell you. My wife and I had heat exhaustion and she and I abandoned the tour and took an Uber back to the ship. Our friends went on with the rest of the tour and told us later that the food was mediocre and that even though we had started the tour with very little food, at the end there was a ton. So much that they couldn&apos;t even eat it. One of the things everyone was looking forward to was the lobster rolls but by the time they got to where they were served, they were too stuffed to eat them. Now we have done food tours in more than 10 cities including two here in Seattle, one in NYC, one in Amsterdam, one in Québec and others in Portland, Oregon, Sante Fe, Savannah and Victoria, BC. This was the worst. It was so bad that I refused to take money from the other six people who were touring with us. I had paid for the tickets in advance so I am stuck but I couldn&apos;t in good conscience charge them. Never tour with this company! The one good thing about missing Bar Harbor was that, as the captain said he, "put the pedal to the metal" and headed to Québec as fast as he could get there. 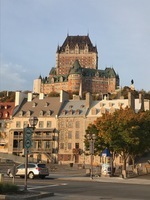 We were originally schedule to arrive in Québec on Sunday, October 14 at 10:00 am and we ended up arriving on Saturday, October 13 at around 7:00 pm. Not only did we get an extra evening and morning in Québec, we also got the BEST mooring spot you can get in Québec, right at the bottom of the lower city with incredible views. The shot you see here is the view from the ship looking up at the city. Only two ships can dock here and the others have to moor around the corner in a much more industrial area. We were glad we weren&apos;t in those spots. An awesome thing that happened due to us getting in early was that the sail-in on St. Lawrence Seaway was during Saturday afternoon instead of early in the morning on Sunday. I got some of my best photos of fall foliage colors on that sail-in. Like the one at right. Now that I have told you that we got in early and why that was so great, I just want to say that we LOVED Québec. This was easily the highlight of the cruise. Two full days to enjoy this amazing city. It is the only place we visited that I want to go back to. It was as close to Europe as you can get and still be on the continent of North America. It reminded me more of Marseilles than Paris. On our first morning I was up early to walk Québec. I did about five miles and traversed the upper and the lower city in the pre-dawn light, to get pictures of the sunrise from the top of the citadel. It was a wonderful experience to be able to leave the ship and come back at any time. Did this both mornings we were in the city and had a wonderful photo experience on both days. I went a little longer on the second day and got even more photos. We had previously booked a food tour of Québec with Tours Voir Québec and we met our guide Richard (pronounced Rishard) at the port in the early afternoon on Sunday. There were eight of us and we had booked a private tour that actually turned out to be a private tour. Just the eight of us and Richard. Our first stop was Cotes a Cotes, a restaurant that had been opened in the mid-1600s where we finally (after all these years of visiting Canada) actually ate poutine. For those who don&apos;t know, poutine is sometimes referred to as the national dish of Canada. It is the ultimate comfort food—french fries covered in gravy and cheese curds. OMG! Why did I wait so long to eat this? Maybe fear of a heart attack? I&apos;m not sure when I will eat it again but it was wonderful. I ate all of mine and about a quarter of Kathleen&apos;s. Then it was on to a wonderful chocolate shop (Le Fudgerie), a cafe where we tried a wonderful terrine made of vegetables, the local farmer&apos;s market where we sampled hard ciders, syrups, macarons and even emu. (My sister-in-law Jamie LOVED the emu–NOT!). All of them were delicious and you can see many of them in my Québec slide show that&apos;s linked here. Our second day in Québec (we sailed at 3:30) was spent just shopping and looking around. Nothing organized.